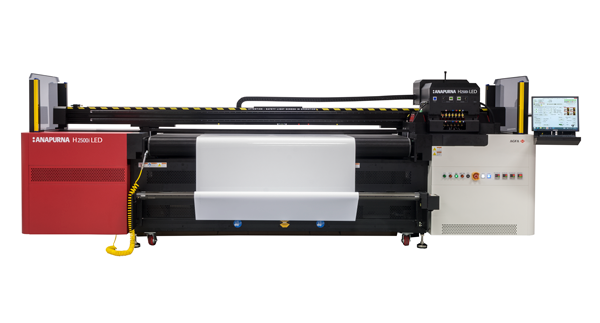 The wide-format hybrid Anapurna H2500i LED is a perfect fit for sign shops, digital printers, photo labs and mid-size graphic screen printers that want to combine board and roll-to-roll print jobs. The 6-color engine prints at a width up to 2.5 m and combines high quality with high productivity for outdoor and indoor, rigid and flexible wide-format jobs. With the automatic board feeder, productivity is increased even more. The white ink function creates possibilities for printing on transparent material for backlit applications or for printing white as a spot color. The Anapurna H2500i LED is fitted with air-cooled UV LED lights that save you energy, costs and time. Due to their minimal energy output, these LED lights are ideal for thin heat-sensitive materials. They also lead to faster operations as they can be switched on and off instantaneously. Thanks to a reinforced belt drive and shuttle beam, the Anapurna H2500i LED printer brings a highly accurate dot positioning and thus excellent image quality, which is further enhanced by the gradient and multi-layer functionality. The eight 12 picolitre heads guarantee printing of good solids, fine text reproduction of up to 4 pt, good tonal rendering and low ink consumption. The Anapurna H2500i LED is fitted with air-cooled 16 Watt/cm² UV LED lamps, which results in a number of unique advantages related to generating extra business, cost savings and environmental friendliness. These include a wider applications scope, higher productivity and less power consumption. Incorporating the latest generation of fast-firing print heads, the Anapurna M2500i offers an impressive throughput. The machine enables you to maintain a high print production on all substrates, satisfying even your most demanding customers. The printer can have an automatic board feeder added in order to increase productivity substantially. This optional table provides an automated solution for volume printing of small board sizes — up to five boards can be printed in parallel. The borderless printing feature makes post-finishing superfluous.